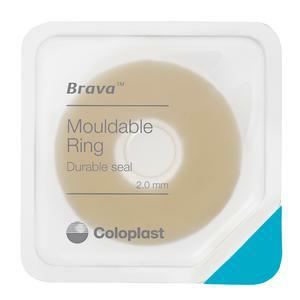 Coloplast's Brava moldable ostomy ring is used in conjunction with the pouch and skin barrier. Its purpose is to form a seal between the skin barrier and the skin around the stoma to protect the skin from irritating stomal output. The Brava™ Moldable Ring features a stronger formula to deliver longer-lasting protection against leakage. The Brava™ rings are designed by Coloplast to be the most durable on the ostomy market. It is easy to use and can be molded to fit your body shape. Brava Moldable Rings and other Coloplast Ostomy Supplies can be purchased from contacting Parthenon online or by calling 1-800-453-8898. Also check out our annual Ostomy Catalog featuring almost every ostomy product available on the market today!